I’ve realized that I really only enjoy sewing clothing. Especially for myself. I’ve focused mostly on sewing clothes for myself for the past year, and I’m a much happier person and enjoy sewing a lot more. But every once in awhile I like to sew something quick, easy, and satisfying. 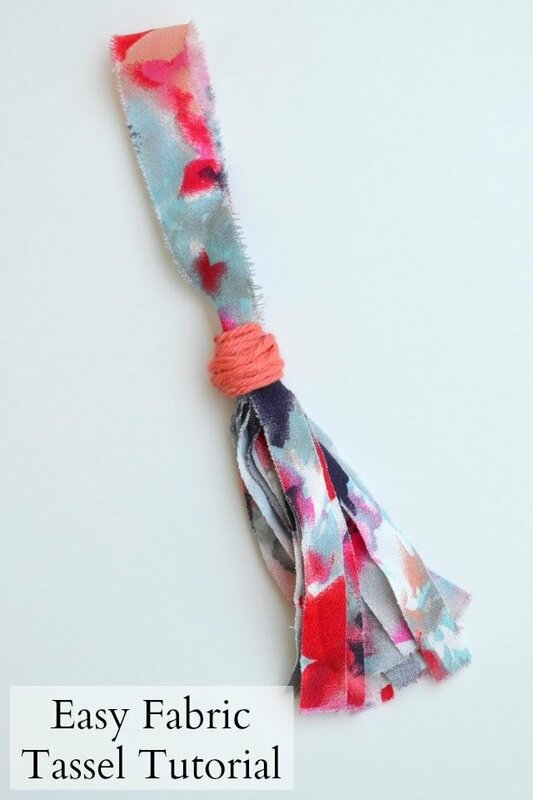 I made an easy fabric tassel to decorate a zipper and so I could keep enjoying one of my favorite fabrics. I only had a scrap left, but I was able to make a tassel from it. Learn how to fix a zipper if the pull came off. 1. Cut a scrap piece on the bias 7.5″ x 4″. 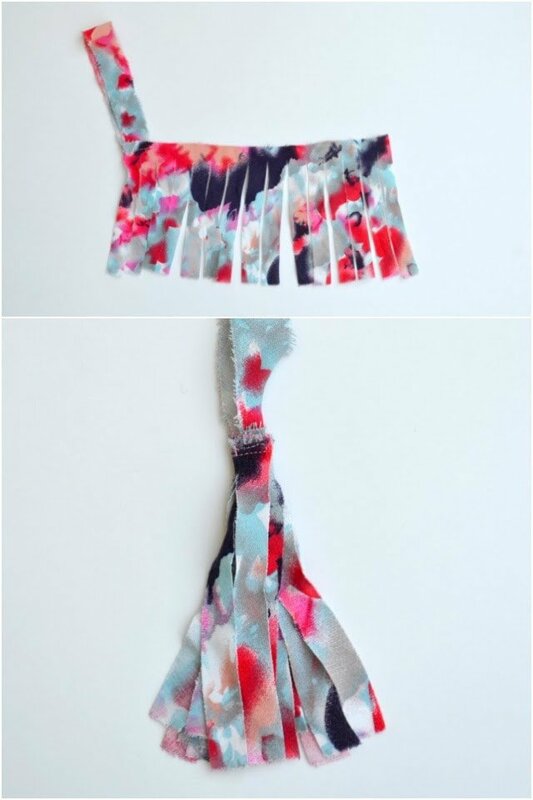 Cut the fabric in strips but stop cutting 1/2″ from the top so it stays connected. 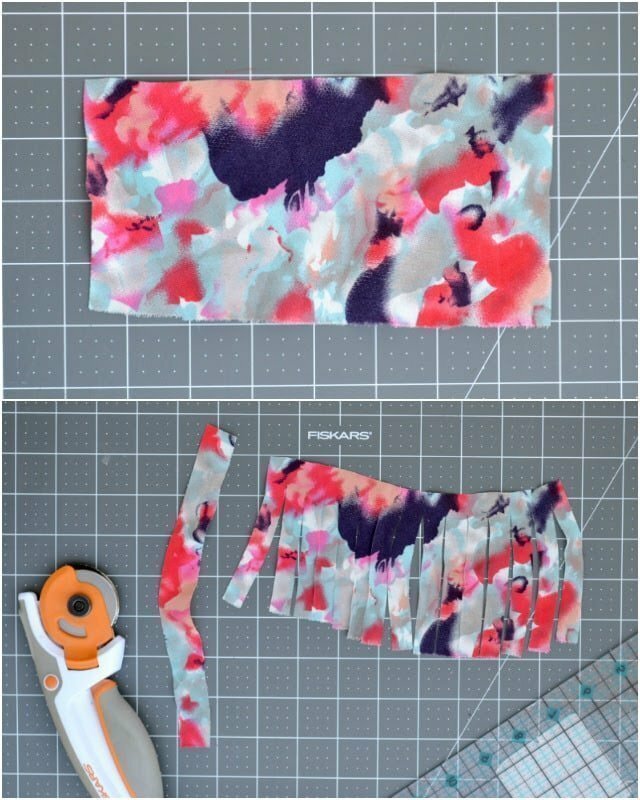 When you cut it on the bias the fabric will not fray even though the edges are not finished. The edges will get a slight feathered look. 2. Cut another piece on the bias 3/4″ x 8″. 3. Fold the thin piece of fabric in half with right sides out. Sew the ends to one corner of the large piece. 4. Starting on the side where the loop is sewn, roll the fabric into a cylinder with right sides out. 5. Tack the tassel at the base of the loop so that it does not unroll. 6. Get your yarn. Hot glue one end right over the stitching. 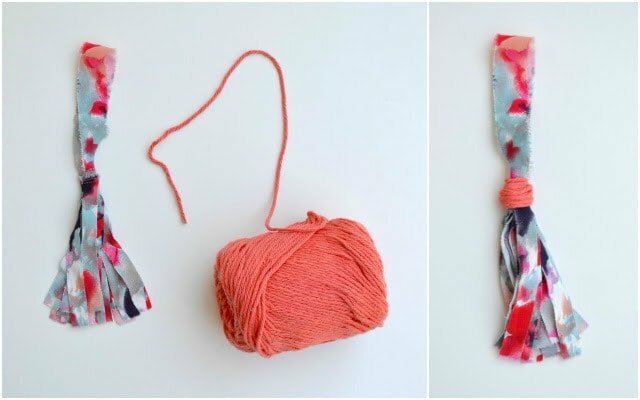 Glue and wrap the yarn until the top of the tassel is covered. 7. Add a knot in the loop at the top of the yarn if desired. 8. Loop and pull through a zipper pull. 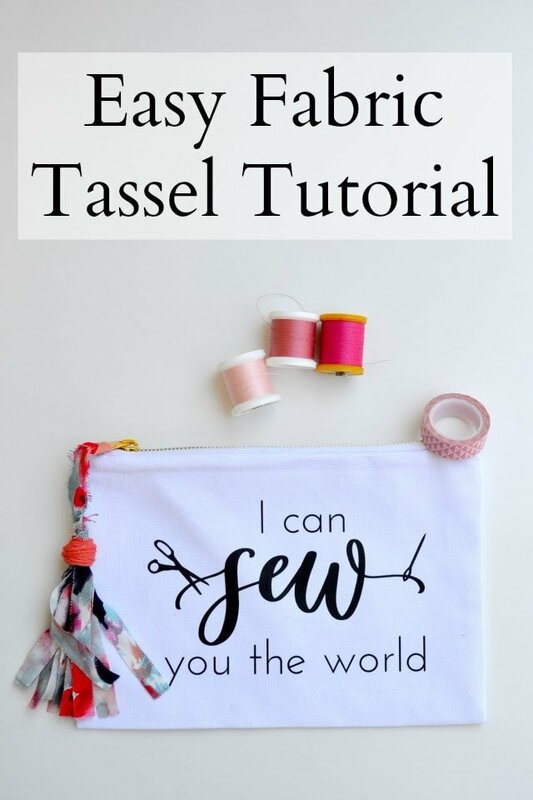 Enjoy your beautiful and easy tassel, and your favorite fabric! 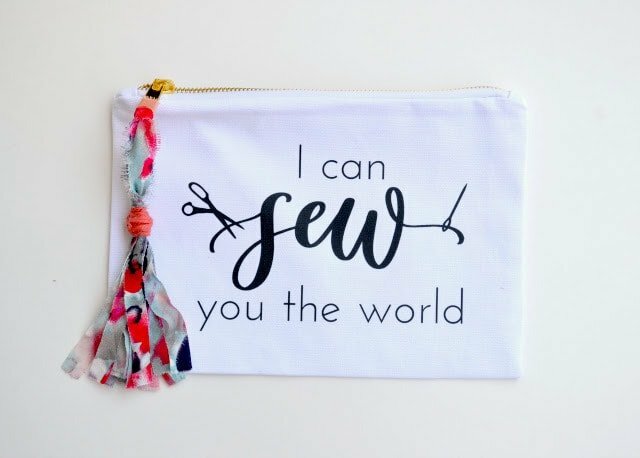 In my Feathers Flights shop I just listed some cute cosmetic bags and tote bags with fun sewing sayings. There are some really fun sayings and designs. I don’t like sewing anything but clothing, remember, but I still like cute bags and showing off that I love sewing! Since these are new designs I’m offering 15% off with the code “happyday” until tomorrow. I won’t do a sale this big for awhile so grab what you want while the code is good! If you don’t want to purchase anything, I’d appreciate a favorite so I know which one is your favorite! 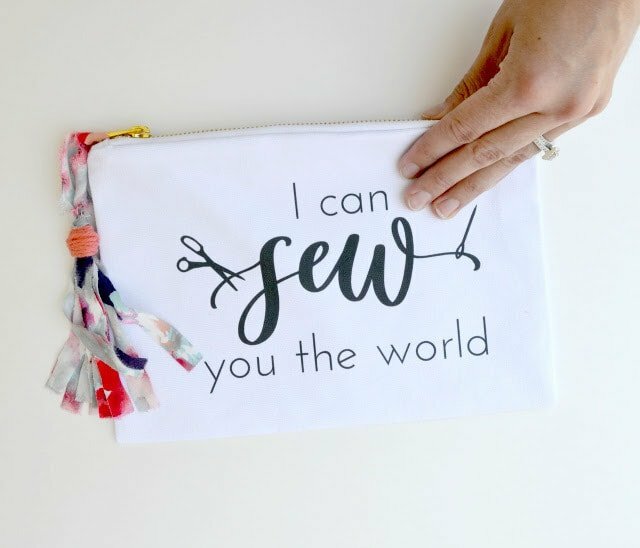 I'm Heather and I love to sew! I'm working towards an inexpensive, handmade life. I'm also a self-proclaimed fabric fondler.